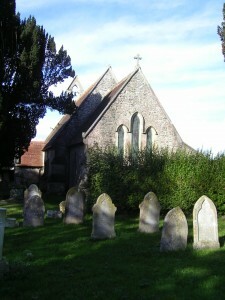 Holy Cross Church and Churchyard is located in Church Road, Binstead. A map and alpha index of Holy Cross Church and Churchyard, Binstead was produced in 1986/87 by the Museums Documentation and Collation Unit Community Programme, sponsored by the Cultural Services Department of the IW County Council, overseen by the County Archivist Mr C Webster. Each memorial was given a number and its position recorded together with an alpha index. This map will be used until full RSHG mapping takes place. Holy Cross Church Map – Plan showing how the individual RSHG numbered maps cover the whole of the Churchyard. The Index contain the names on all the graves that have been mapped whether they have been transcribed or not. Memorials inside the church are shown in the index with location ICH.